The holiday season is once again upon us as we prepare for Thanksgiving, Hanukkah, Christmas, Kwanzaa, New Year’s, and, don’t forget, National Poinsettia Day. That’s right, Dec. 12 is National Poinsettia Day. Congress officially chose Dec. 12 to honor the passing of Joel R. Poinsett, the statesman and botanist who first introduced this plant to the U.S. The poinsettia (euphorbia pulcherrima) is native to Mexico. The Aztecs cultivated the poinsettia long before Europeans discovered their civilization. The Aztecs used the poinsettia as part of their mid-winter celebrations and planted it widely throughout their gardens. In 1825, Poinsett was sent to Mexico as the country’s first U.S. ambassador. He was fascinated with a beautiful shrub with large, red flowers that grew everywhere in the countryside. He not only brought cuttings back for his own greenhouses in South Carolina but also sent many to other plant enthusiasts throughout the country. The poinsettia is also known as “Flower of the Holy Night” because it blooms during the Christmas season. The legend is told of a poor, young Mexican girl named Pepita who had no gift to present to the Christ child during a Christmas Eve service. As she walked to the chapel not knowing what else to do, Pepita gathered a handful of common weeds and fashioned them into a small bouquet. As she approached the alter to present the bouquet, she remembered the kind words spoken to her by her cousin: “Even the most humble gift, if given in love, will be acceptable in his eyes.” As she laid the bouquet of weeds at the foot of the nativity scene, suddenly the flowers burst into brilliant red bloom. All who were present in the chapel were sure they had witnessed a Christmas miracle. The poinsettia was first commercially sold in this country in the 1850s. Today, there are more than 68 million plants sold each year, making the poinsettia the top-selling potted plant in the green industry. The most common color is red; however, they are also available in pink, white, marble, and speckled shades. The colorful parts of the poinsettia are actually modified leaves called bracts. The flower of the poinsettia is very small and located in the middle of the bract. 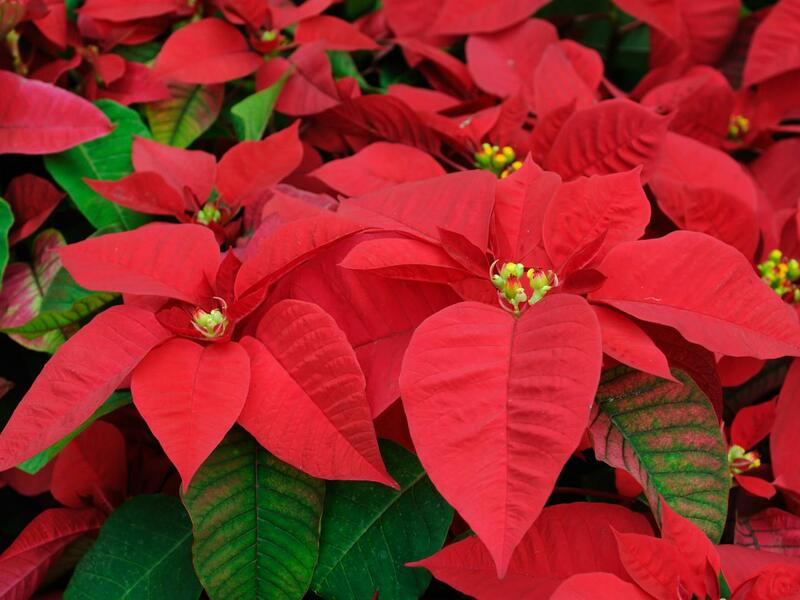 When choosing a poinsettia, be sure to choose one with lots of healthy green leaves and colorful bracts. Like most indoor plants, the poinsettia needs a well-drained pot. If water is not able to drain through the container in which the poinsettia is planted, your plant will develop serious root-rot problems. If the temperature gets below 50 degrees Fahrenheit or above 80 degrees Fahrenheit, poinsettias tend to drop leaves. Try to avoid drafts or keeping your plant too close to heat sources. Contrary to popular belief, the poinsettia is not a poisonous plant. Poisindex, the primary information source used by most Poison Control Centers, has stated that a 50-pound child would have to ingest more than 500 poinsettia bracts to have any level of toxicity present in their system. Even at that level of toxicity, the child would probably only experience a severe stomach ache. A question frequently asked is, “How do I get my poinsettia to rebloom?” To reflower, a poinsettia must have 14 hours of darkness per day from early October to mid December. I have heard of people covering the plants with lightproof bags, placing them in dark closets, and keeping them in the shadows of their basement. Personally, I have never attempted to have a poinsettia re-bloom. My assumption is with 68 million plants sold each year, attempts at re-blooming are not very successful. I’d like to wish everyone a very merry and happy holiday season!